news 30.12.2011: With the motivation to surf over the Dubai Palm, Oliver carried his Skyboard all the way from Europe to Middle East. 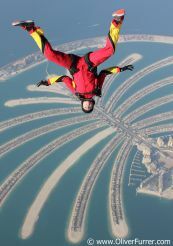 He was shocked to hear that the Skydive Dubai policy and the snooty Staff prohibited him to skysurf, even his equipment passed the FAI / USPA criteria. 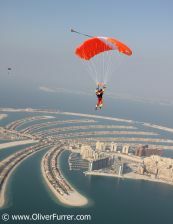 Sadly to say - this is the only DropZone on the world where this nice air sport is not allowed! 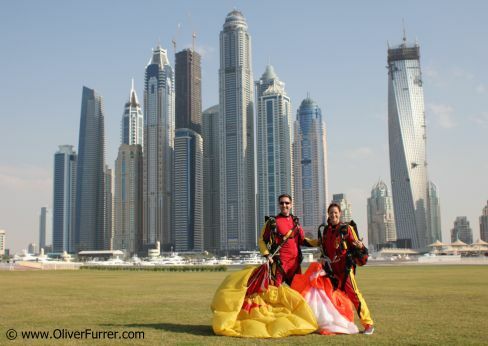 Luckily Oliver and Corinne could do a fun-freefly skydive after a mediatory, low "hop & pop" jump!